The 2013 Volkswagen Jetta Sportwagen Review: The Jetta Sportwagen is ideally suited to my needs and tastes. Compact, but with room for five people, it has more than 66 cubic feet of carrying capacity in back with the second row seats folded. It's lively and fun to drive, especially when you order it with the six-speed manual transmission. And, for commuting, the TDI Diesel version, which I tested, boasts 42 miles per gallon on the highway. My tester arrived in Tempest Blue, a color I might actually select if I were buying one. The design is smooth and pleasant, without any sharp edges or trendy angles or styling quirks. Volkswagen has stayed away from extremes, with more of a Brooks Brothers look than the runway fashion trend of the day. This design is actually a few years old, and has a softer presentation than the sharper look of the newest Jetta and Passat. As Jettas have been for years now, this car is built in Puebla, Mexico, but it has a German engine and transmission. The Puebla plant, birthplace of swarms of Beetles, has workers with lots of experience, and the quality of assembly and materials is just fine, thank you. The car's interior is what you'd expect with a VW, rather conservative, but that's really a virtue in a car that you plan to spend time in. There's nothing to distract you from your tasks. The gauges are clear and uncluttered. I did find the climate dials to be small and hard to decipher in their low position on the center console, but after I studied the settings (while parked) I got the hang of it, and the brushed metal trim is very nice. My car was happy to pair with my iPhone, but I got more than I expected, when Bluetooth attached itself to some downloaded music. I kept getting the same song playing a few seconds after the car started, while the phone was connecting. After a push or two on the Satellite Radio button I was hearing what I wanted again. The sound of the audio system was good, but not the best I’ve experienced. The Jetta Sportwagen comes with either a 2.5-liter in-line five-cylinder engine or the super-mileage 2.0-liter TDI Diesel. The veteran 2.5-liter offers 170 horsepower and 177 lb.-ft. of torque, and is a perfectly good engine for driving around a 3,300-pound sedan or wagon. But the TDI Diesel, although it has "just" 140 horsepower, as Diesels do, offers much more torque, 236 lb.-ft. in this application. That means that the car feels stronger than you might expect. Combining the small engine size with the efficiency of Diesel means that I was able to get 40.3 miles per gallon during my week of commuting and errand running. EPA numbers are 30 City, 42 Highway and 34 Combined. Diesel has traditionally been less clean, but today’s fuel, engines and treatment systems mean great numbers. My tester got EPA ratings of 5 for Smog and 8 for Greenhouse Gas. Diesels are fairly rare in the U.S., still, but are common in Europe. The advent of low sulfur fuel has taken almost all the negative aroma factor out of visiting a service station. Diesel fuel was priced at the same level as mid-grade gasoline during my test week, just about $4.00 even, but with that kind of economy, it's a real deal. And, with its 14.5-gallon tank, you can go about 600 miles without stopping to refill. So go ahead and take that trip from San Francisco to San Diego. Speaking of refueling, there are plenty of places to buy Diesel, but not every station carries it, so it's good to start looking when you hit the quarter tank mark. My tester came with a huge panoramic sunroof. However, if you buy this car without it and the accompanying 17-inch alloy wheels, you’ll save $1,800.The base Sportwagen is the S, which starts at $21,390, with the 2.5-liter gas engine and manual six-speed transmission. This is by no means stripped down. You still get leather on the steering wheel, air conditioning, cruise control, Bluetooth, heated seats, and more. You can step up to the SE and add the comfy leatherette seating, a stronger audio system, alloy wheels, chrome trim and leather on the shift knob. The TDI then arrives. Get it with or without a sunroof, or with sunroof and navigation. Even at that pinnacle of Sportwagens you'll pay a little under $30,000. My tester, without navigation, was $28,390. All prices include shipping. Volkswagen provides three years of free scheduled maintenance, which makes that period very inexpensive. Some cars are more fun to drive than others. Some are more economical. Some are more practical. 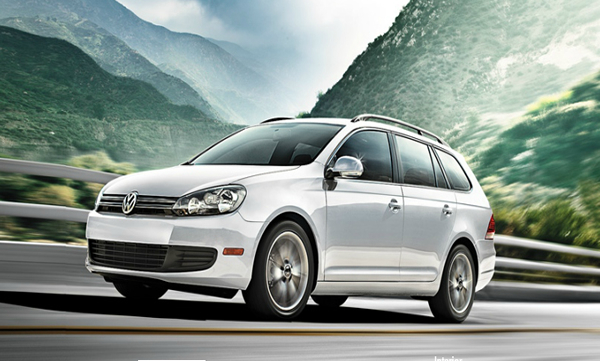 The Jetta Sportwagen is really more of everything, except expensive.